Our organization wouldn’t be anything without our selfless and generous staff and volunteers! We are thankful for their sacrificial serving and the way they invest their time into developing the local community. Therefore, we think it is essential to present you with some of their thoughts that when you put them all together, like a puzzle, they form some thoughts and ideals of ‘For One Life’. So, please meet Lalngailien Joute or simply, Eljay as everyone calls him! Take some moments to read this interview and learn a little bit more about him and eventually the way that For One Life engages the local community. My daily tasks involve dealing with clients who want to rent the Blue room and the Life Café. And since I’m also in charge of promotions, I post some advertisements in our Social Media pages, while also responding to questions and queries that are raised! Before working for For One Life, I used to spend a lot of time at the Life Café, I even performed a number of times on Live Music Thursdays and Open Mic Nights. 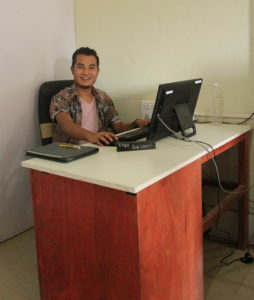 I also used to work as a part-time school teacher and freelance singer in various places of Churachandpur. 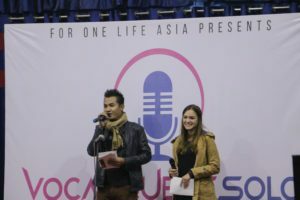 By the end of 2017, I was invited by For One life Asia to be the host of the singing competition, Vocal Quest Solo Churachandpur, which I did with my co-host Rosie Esh. In short, by the end of 2017 (after the end of Vocal Quest Solo), I was approached by Michael Esh (Director of For One Life International) after he heard I was looking for a full-time job. Eventually, I joined For One Life on 3rd Jan 2018. To begin with, I would like to say that no job is good enough unless you try to make the best out of it. Even though it has only been a couple of months since I started working for For One life, I have had the privilege to go to some of the charity works that were organized. This work has taught me so many lessons in many aspects. I feel that I have already had the opportunities to learn how to have a heart that gives, the value of giving or helping someone. It helps me grow as a person as well as develop my personality by interacting with clients. Lastly, each day is a new learning experience and I’m still learning and developing on a daily basis. There are so many talented artists present in Churachandpur, India who haven’t got any chance yet to showcase their talent. As I am in charge of the Live Music Thursday for Life Café, I am constantly inviting local singers, some of them beginners and some professionals. We do our best in promoting them by giving them a chance to showcase their talent at the café and some other events that we organize and they get paid for that. That in turn got them recognized and hired/invited by some other events organized. For one Life has already played a very important role in developing the community in Churachandpur, especially with the establishment of Life Café, the first ever café plus fine dining restaurant in the area. People get to experience something they never had before. And I believe that there will be more improvement in the infrastructure here. With the construction of the stadium and its surroundings, it will create lots of job opportunities for the people of Churachandpur in the future. One day I went to one of the charity works organized by For One Life. There, we distributed bags of rice plus few other food items to some of the unemployed widows in our community. One of the widows came to us and said “Lalpa in a nau hai mamaw a hrieta, a hun takah a pek hlak” that means “The Lord knows exactly what his children needs are and He provides for them just in time” as they ran out of rice that very day. That was a moment I will never forget. Even though it made us teary, we were filled with joy at the same time. To be honest, it has only been a couple of months that I have been working for For One Life. Therefore, I do not believe I have had struggling moments worth mentioning besides the heart wrenching moment I experience every time I see someone poor who needs help. But no one knows what the future holds so let’s leave that in God’s hand. There are so many qualities that I admire about the other team members of For One Life. They encourage and motivate me in so many different ways! I also learn from their willingness to give, their humility, their unity as a team and leaving everything in God’s hand with a word of prayer before taking any actions! To begin with, I am a very impatient person. And since I am responsible for events at the Life Café, I worked at the café for a month and that really tested my patience. I would say that dealing with and serving different kinds of customers, has been the best way to work on patience. I’m still working on it though! I also feel that it has helped me in developing my personality. Working for For One Life, and since our work is mainly based on charity work, I have learned the importance of “Trusting in God”. I can finally say that I Trust in God more than I ever was. And that itself is a blessing. I always wanted to be a good orator but I ended up being a singer in public. I feel that these two qualities go hand in hand. So, I hope that one day I will be able to speak in public properly like I can sing now. That way I can interact with more groups of people, people of different age groups from the community. What is your favourite For One Life project ​(besides the one you are currently involved in) and why? Children’s retreats are is my favorite For One Life Project besides the one I’m currently involved in! They give local children an opportunity to forget their hardship by playing games and developing new skills. Children’s retreats teach kids some valuable life lessons by teaching them Bible stories, praise and worship songs and inspiring them for the life that’s ahead of them!